Seed collecting is fun gardening with a purpose. Furthermore it is a great activity for the whole family to do together. Once you know how to collect from your own garden, you will soon start finding opportunities to add new plants to the landscape by collecting seeds everywhere you go. However, collecting seeds does not come in a one-size-fits-all type program. Plant seeds are as different as the plants that produce them, and so ways to collect and harvest them are just as diverse. There is one thing better than growing your own plants and that is growing them from seed you have saved yourself. Enthusiastic gardeners love a challenge, and find great satisfaction from mastering the technique of collecting and planting seed. The creation of new varieties is perhaps the most exciting aspect of growing plants from seed you collect yourself at home. 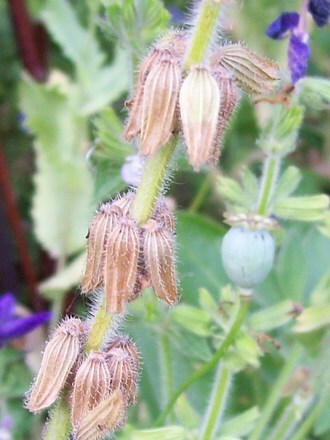 When two plants are crossed, each resulting seed is unique in its characteristics. Because of genetic variability, the offspring can be totally unlike either parent. Through controlled crosses many fine ornamentals and vegetables have been created and avid gardeners may be able to create new and exciting hybrids in their own backyards. For the job at hand, most of the materials that you will need can be found in your kitchen or office: Scissors, greaseproof paper, a strainer, envelopes, re-sealable containers, stickers, and a pen. You can do it indoors or outdoors, but it is essential that you do it in still air. Outdoors is probably best if you are an asthmatic because there is a chance that you will be creating some dust. Annuals are some of the best and most popular plants to grow from home-saved seed, but bulbs, perennials and even some shrubs and trees can be equally rewarding. Many people ask whether seed can be collected from fruit trees and then propagated to grow another tree (Much like a child asking if they can grow an apple tree from the seeds in their apple core). The answer is definitely 'Yes'. However, because many fruit trees have been grafted the seed that you plant most probably will not produce the apple that you just ate. It will always revert back to the original plant. Therefore most fruit trees are better grown from cuttings or other forms of propagation than to plant from seed. 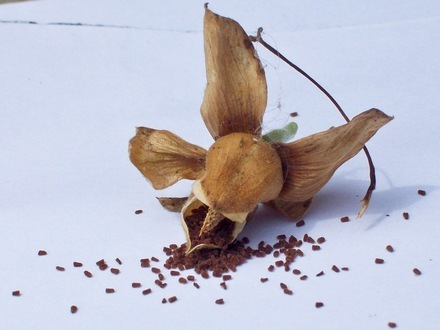 - Allow the seed cases to turn brown and die. - Remove the seed cases from the plant and place them on a tray with some baking paper underneath. Leave the tray in a cool, well ventilated place to dry out. (The paper is to help you find the seeds after they have been evicted from their casings). - Once the pods or casings are completely dry, it is just a matter of gently shaking them onto the paper. Remove any husks and dry foliage from the seeds and pour into an envelope. Place the envelope in an airtight container with a desiccant such as calcium chloride or silica. - Label and date the seeds and store for the next season. When it comes to storing the seeds of peas and beans, it is important to remove them manually from the pods and dry them thoroughly. Seed will store best in a resealable airtight container - try camera canisters or jam jars. Another tip is to add a pinch of powdered sulphur to control pests and diseases during storage. Seed viability depends on airtight storage in a dry, dark, cool place. Remember that seeds, when exposed to air, have a limited life and the minute a sealed container is opened, the seed will start to age. A refrigerator is a good place to store your seed collection because it has a cool even temperature and is dark. However, if you are worried about children getting into the seeds, a cool, dark, airy cupboard would be suitable instead. Some seeds, such as those recommended below, are very straightforward and simply require storing until they are ready for sowing, either into pots or directly outside. Others, however, may need specific preparation before they will germinate, such as exposure to certain temperatures, soaking, or breaking the seed coat. You will have your successes and failures � which makes it all the more interesting. Some easy seeds to collect and sow: Tomatoes, lettuce, pepper, eggplant, beans, peas, carrots, herbs, foxglove, love-in-a-mist, sunflower, cosmos, honesty, anemone, etc. With most garden seeds their shelf-life is usually a few seasons. However, germinating them when they are fresh is usually your best option and will give you better results. Before planting, it is a good idea to check stored seed for its germination rate. 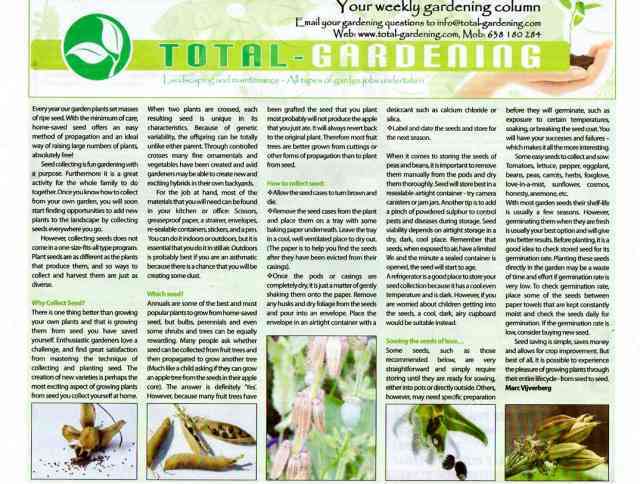 Planting these seeds directly in the garden may be a waste of time and effort if germination rate is very low. To check germination rate, place some of the seeds between paper towels that are kept constantly moist and check the seeds daily for germination. If the germination rate is low, consider buying new seed. 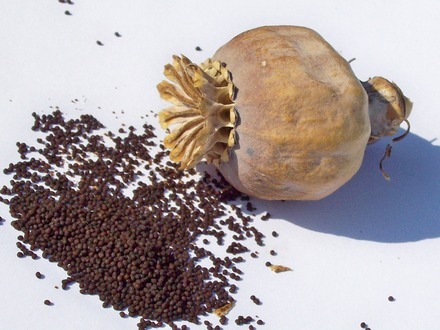 Seed saving is simple, saves money and allows for crop improvement. But best of all, it is possible to experience the pleasure of growing plants through their entire lifecycle - from seed to seed.